Britain has become synonymous with some of the world’s most coveted sporting events and every year plays host to a large number of sporting events that attract huge followings from around the globe. But where are these sports played; we take a look at some of the most important sporting venues in Great Britain. Back in the years after the First World War Wembley Stadium – or Empire Stadium as it was known then – was built in 300 days at a cost of £750,000; that was a small price to pay for something that would become as much a part of British heritage as the events that would be held within it. The first ever event to be held in the stadium was the White Horse Cup in 1923. This was later to become known as the FA Cup, an event that has been staged at Wembley since 1923. 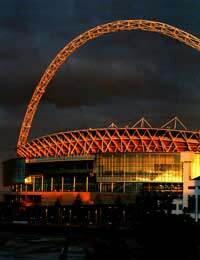 Apart from the addition of floodlights in 1955, and a roof and electronic scoreboard in 1963, the stadium remained unchanged until it closed in the year 2000 to make way for a newer Wembley Stadium. During its time the stadium has played host not only to the many football matches that were played there but also many of the top rock and pop acts of the modern era. Artists such as Prince, Genesis, The Rolling Stones, The Who, and Pink Floyd have all graced its pitches. On Saturday 13th July 1985 Wembley became the focal point for Live Aid – the world’s largest charity concert gathering together some of the biggest names in show business. The new Wembley stadium is 180,000m2 of floor space and comprises some 212,000 tonnes of concrete and 23,000 tonnes of steel. Football legend Pele once described Wembley as ‘the church of football’. Old Trafford is the home of Manchester United Football Club and was built in 1909 for the sum of £60,000. The stadium was designed to hold 80,000 people and was designed by Scottish Architect Archibald Leitch. Leitch also designed White Hart Lane (Home of Tottenham Hotspur), Ibrox Stadium (Rangers Football Club) and Hampden Park (Scottish National stadium in Glasgow). The stadium was badly damaged during the Second World War as Germany attacked from the air during the Blitz and was rebuilt between 1946 and 1949. The stadium was rebuilt to the exact specifications and designs as it had been originally and was reopened in 1949. During the 1966 World Cup the ground played host to three matches. Old Trafford has seen many famous feet trod its hallowed turf including Sir George Best, David Beckham, Denis Law and Sir Bobby Charlton and as we enter the last few years of this decade there are plans to rebuilt part of the stadium to allow for maximum capacity of 91,000. The Crucible Theatre in Sheffield is the home of not only one of Britain’s most revered theatres but also the home of Britain’s top venue for the sport of Snooker. Built in 1971 The Crucible Theatre is home to the World Snooker Championships and has been since 1977. The Crucible, although not the largest sporting venue in Great Britain, seats 980 in such a way that all of spectators sitting around the theatre can see the action and during the earlier stages of the competition the theatre itself is split in two so that two matches can be played. These are, of course, just some of the sporting venues in the United Kingdom but are the three main venues to which thousands of people flock each year in the hope of seeing their sporting heroes overcome the odds to take first place in their chosen discipline.